There is little argument the steak of employment growth is quite phenomenal and comes amid hopes the economy is beginning to shift into high gear. But if employment is as “strong” as is currently believed, then I have a few questions for you to ponder. These questions are important to your investment outlook as there is a high correlation between employment, economic growth and, not surprisingly, corporate profitability. 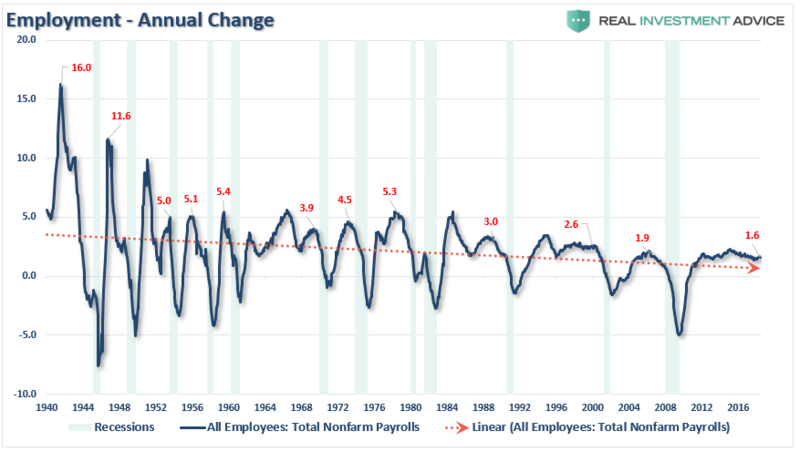 Prelude: The chart below shows the peak annual rate of change for employment prior to the onset of a recession. The current annual rate of employment growth is 1.6% which is lower than any previous employment level prior to a recession in history. Question: Given the low rate of annual growth in employment, and the length of the employment gains, just how durable is the job market against an exogenous economic event? More importantly, how does 1.6% annualized growth in employment create sustained rates of higher economic growth? Prelude: One thing which is never discussed when reporting on employment is the “growth” of the working age population. Each month, new entrants into the population create “demand” through their additional consumption. Employment should increase to accommodate for the increased demand from more participants in the economy. Either that or companies resort to automation, off-shoring, etc. to increase rates of production without increases in labor costs. The next chart shows the total increase in employment versus the growth of the working age population. Question: Just how “strong” is employment growth, really? The next several charts focus on the idea of “full employment” in the U.S. 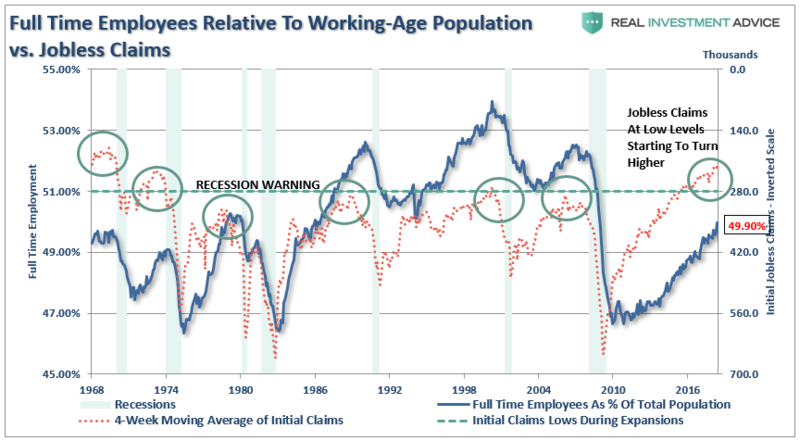 While Jobless Claims are reaching record lows, the percentage of full time versus part-time employees is still well below levels of the last 35 years. It is also possible that people with multiple part-time jobs are being double counted in the employment data. Question: With jobless claims at historic lows, and the unemployment rate at 4%, then why is full-time employment relative to the working age population at just 49.9%? Prelude: One of the arguments often given for the low labor force participation rates is that millions of “baby boomers” are leaving the workforce for retirement. This argument doesn’t carry much weight given the significantly larger “Millennial” generation which is entering into the workforce simultaneously. 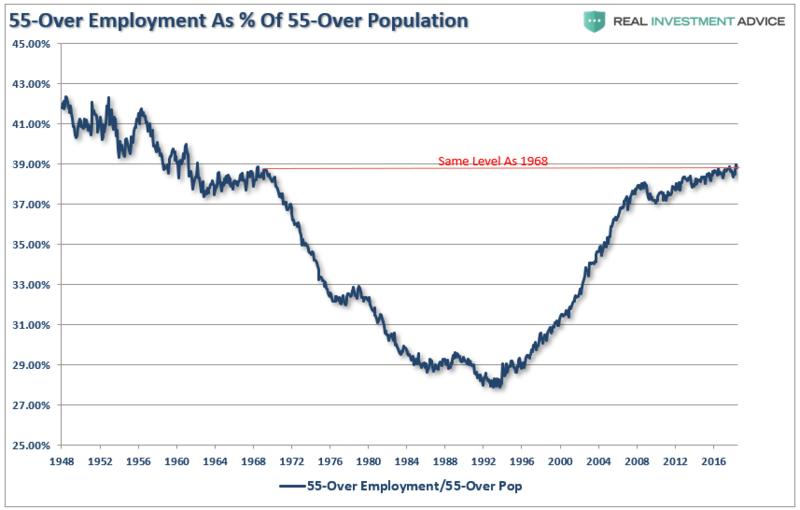 Question: At 50.43%, and the lowest rate since 1981, just how big of an impact are “retiring baby boomers” having on the employment numbers? Prelude: One of the reasons the retiring “baby boomer” theory is flawed is, well, they aren’t actually retiring. 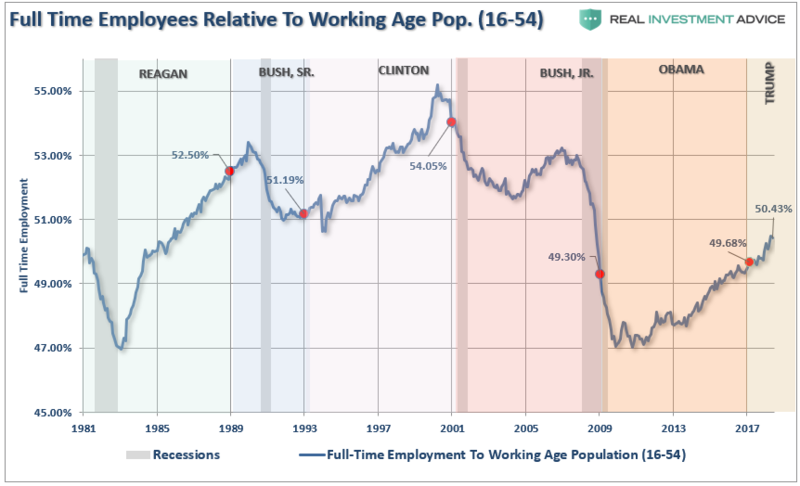 Following two massive bear markets, weak economic growth, questionable spending habits and poor financial planning, more individuals over the age of 55 are still working than at any other time since 1970. The other argument is that Millennials are going to school longer than before so they aren’t working either. 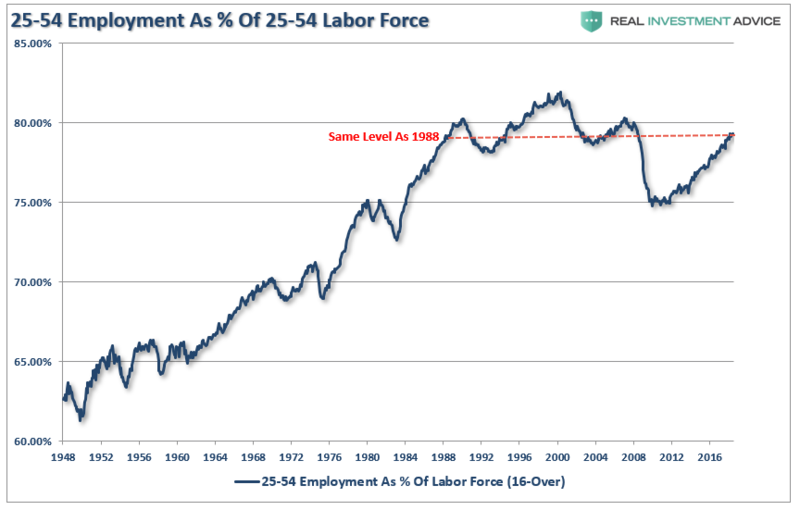 The chart below strips out those of college age (16-24) and those over the age of 55. Those between the ages of 25-54 should be working. Question: With the prime working age group of labor force participants still at levels seen previously in 1988, just how robust is the labor market actually? Prelude: Of course, there are some serious considerations which need to be taken into account about the way the Bureau of Labor Statistics measures employment. The first is the calculation of those no longer counted as part of the labor force. 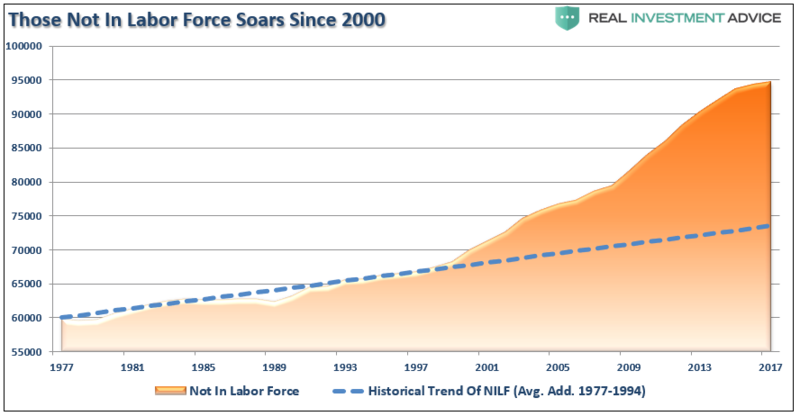 Beginning in 2000, those no longer counted as part of the labor force detached from its longer-term trend. The immediate assumption is all these individuals retired, but as shown above, we know this is exactly the case. Question: Where are the roughly 95-million Americans missing from the labor force? This is an important question as it relates to the labor force participation rate. Secondly, these people presumably are alive and participating in the economy so exactly how valid is the employment calculation when 1/3 of the working-age population is simply not counted? Prelude: The second questionable calculation is the birth/death adjustment. I addressed this in more detail previously, but here is the general premise. Following the financial crisis, the number of “Births & Deaths” of businesses unsurprisingly declined. Yet, each month, when the market gets the jobs report, we see roughly 200,000 plus jobs attributed to positive net business creation. 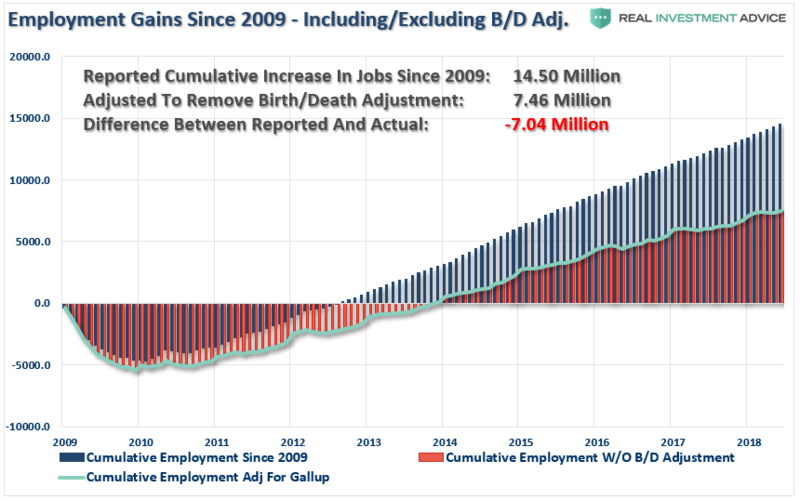 Included in those reports is the ‘ADJUSTMENT’ to account for the net number of new businesses (jobs) that were “birthed” (created) less “deaths” (out of business) during the reporting period. 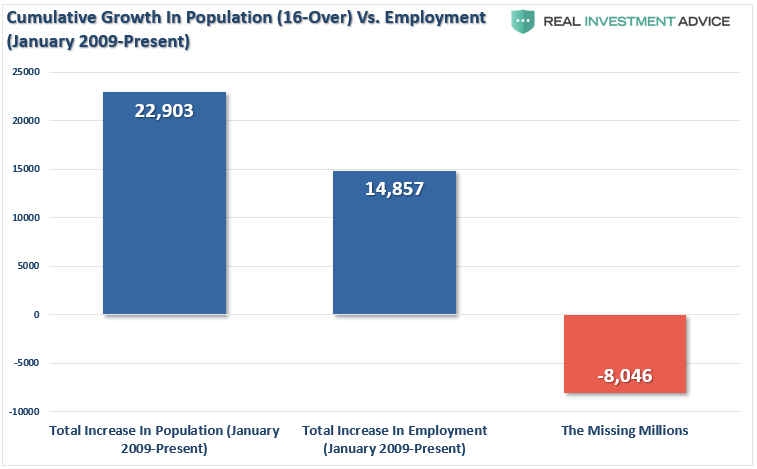 Since 2009, the number has consistently “added” roughly 800,000 jobs annually to the employment numbers despite the fact the number of businesses was actually declining. The chart below shows the differential in employment gains since 2009 when removing the additions to the monthly employment number through the “Birth/Death” adjustment. Real employment gains would be roughly 7.04 million less if you actually accounted for the LOSS in jobs. We know this number is roughly correct simply by looking at the growth in the population versus the number of jobs that were estimated to have been created. Question: If we were truly experiencing the strongest streak in employment growth since the 1990’s would not national compensation be soaring? 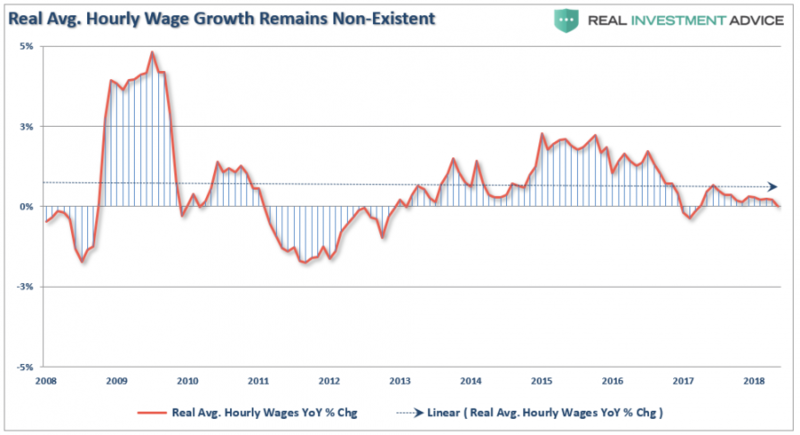 Prelude: If the job market was as “tight” as is suggested by an extremely low unemployment rate, the wage growth should be sharply rising across all income spectrums. 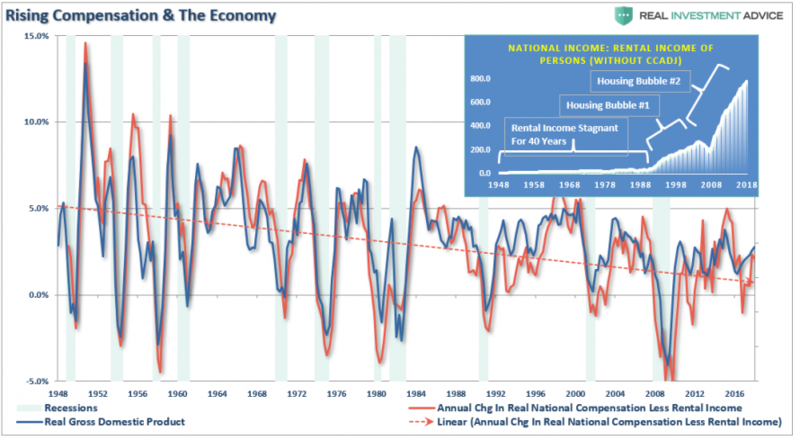 The chart below is the annual change in real national compensation (less rental income) as compared to the annual change in real GDP. Since the economy is 70% driven by personal consumption, it should be of no surprise the two measures are highly correlated. Side Question: Has “renter nation” gone too far? However, if we dig in a bit further, we see that real rates of average hourly compensation remains virtually non-existent. Question: Again, if employment was as strong as stated by the mainstream media, would not compensation, and subsequently economic growth, be running at substantially strong levels rather than at rates which have been more normally associated with past recessions? I have my own assumptions and ideas relating to each of these questions. However, the point of this missive is simply to provide you the data for your own analysis. The conclusion you come to has wide-ranging considerations for investment portfolios and allocation models. Or, considering the fact the Fed is tightening monetary policy by raising rates and reducing liquidity, does the data suggest a “monetary policy” accident and recession are an under-appreciated risk? But then again, maybe the yield-curve is already telling the answer to these questions. That however depends on which yield curve you look at. For our latest on the Fed’s shifting narrative on the value of the yield curve please read our latest article – The Mendoza Line.